Michael's nostalgic tribute to New York City (set in the 1920's), is what he considers his most personal painting to date. 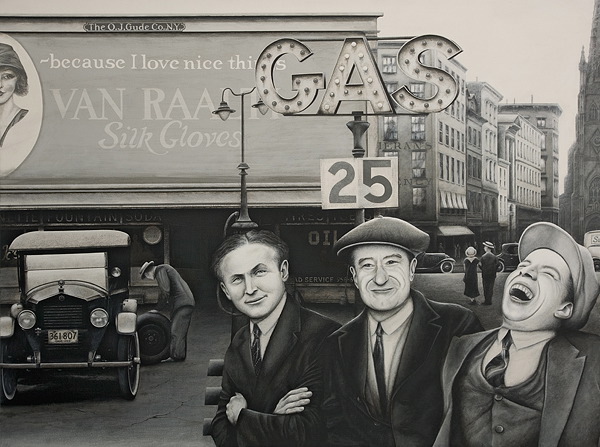 This period piece brings to life in vivid detail: buildings, billboards, vehicles and figures of the time, all capturing a moment of a bygone era. The nostalgia doesn't stop there. Of special importance, are the three figures in the foreground, Michael's heroes: (left to right) Harry Houdini, Michael's father Joseph, and Charlie Chaplin*. New York is being offered as a giclée on canvas reproduction, with the limited production of 99 signed and numbered pieces. The canvas measures 28" x 36"
*Artist's note: Michael is grateful for the generous permission of the Chaplin family, of his painted rendition of a Chaplin Estate photograph.